This 20ft x 10ft Wooden Workshop is the largest in the range and provides both storage and work space. 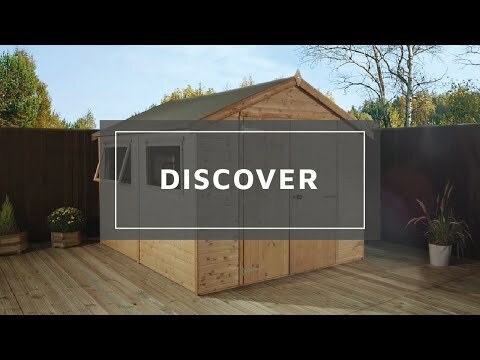 Constructed using high grade 12mm Shiplap Tongue & Grove cladding, this garden building is a long lasting and hard wearing addition to your garden. This garden shed is ideal if you want a large interior space that can serve a variety of purposes, such as a workshop or large storage space. Review:Don't know - haven't got it yet. It is wonderful knowing you are extremely pleased with the excellent value of your workshop and I thank you again for your positive review. I am pleased that you are happy with the quality of your shed and we take your comments on board. If you have any outstanding queries, please contact us on either 0800 029 1000 or service@waltons.co.uk. Thank you again for your much appreciated feedback. I am so pleased that you are very happy with your shed and find it to be of great value for money. Thank you again for your feedback - it is much appreciated!